SharePoint Managed Services. Done Right. Offloading your SharePoint maintenance to Imaginet allows you to concentrate on what you do best – managing the core competencies of your business. Schedule your free SharePoint Managed Services consultation call now. Costly downtime and outages. More than 80% of organizations experience unplanned downtime multiple times per year and 5 outages caused by IT Team errors. Lack of trained personnel. 43% respondents pointed to ‘a lack of administrator skills, training and knowledge as an inhibitor to efficiently leveraging SharePoint. High maintenance costs. Average costs to manage SharePoint are approximately $46/user per month. During downtime, total costs double to $90/user. Frustrated by these issues? Let Imaginet help! Gain Productivity. Gain Peace of Mind. Imaginet's SharePoint Managed Services eliminates the need to hire and maintain qualified full-time SharePoint administrators supporting your on-premises or cloud SharePoint environments. Offloading your SharePoint maintenance to Imaginet allows you to concentrate on what you do best – managing the core competencies of your business. Full control without needing to be fully responsible for the environment maintenance. Minimize costs of SharePoint maintenance, support, and enhancements. 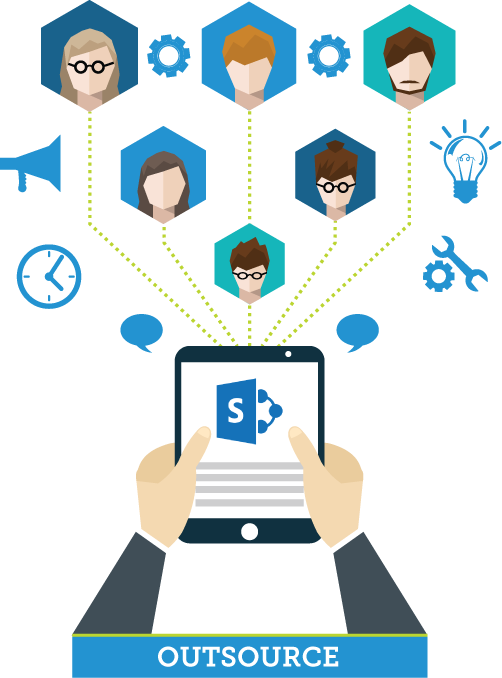 Access to experienced and qualified SharePoint experts with up-to-date knowledge to assist in enhancing your solution. Imaginet offers 3 different SharePoint Managed Service packages, providing you with the optimum level of the service you need with maximum flexibility to best support your SharePoint environments. ** Lite is pre-billed annually; Pro is billed monthly; Premium is billed quarterly. **** Normal business hours – 1 unit per hour, after hours – 1.5 unit per hour. Additional purchased support hours billed monthly. With over 20+ years experience, Imaginet's certified SharePoint experts are ready to help you ensure the long-term success of your SharePoint environments. Take advantage of our Imaginet SharePoint Managed Services where all of your SharePoint operations are handled by our Certified SharePoint Specialists. Get started — schedule your free consultation call today! SharePoint Managed Services offered worldwide.